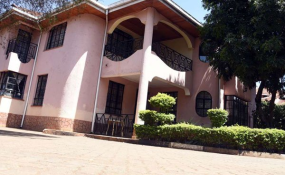 Lawyer Assa Nyakundi's house in Muthaiga, Nairobi, in this picture taken on March 18, 2019. City detectives have found more firearms and bullets during a search in the home of a lawyer who 'accidentally' shot his son near their house in Muthaiga North. The search on Monday unearthed two guns and 471 rounds of ammunition kept in different rooms in the house. According to police, a pistol was found inside a safe in one bedroom and a shotgun found in a shoe rack in the library. Also found were 285 rounds of 9mm, 47 rounds of .357 of 12 gauge, a black holster and a firearms certificate bearing the lawyer's name. Lawyer Assa Nyakundi Kibagendi surrendered to police on Sunday and has since been kept under custody. He is being treated as a suspect in the death of his 29-year-old son Joseph Nyakundi. Fresh details have emerge as police continue to piece evidence on the circumstance of the death. Police say the suspect's pistol was fired twice and not once as had earlier been reported. The pistol was also found to have been loaded with 13 rounds of ammunition and not 14 as earlier thought. An inspection of the lawyer's motor vehicle found one spent cartridge under the mat of the front passenger seat. A bullet head was also found in the boot. Blood stains were found on the upper left side of the back seat with a bullet hole visible on the seat. The lawyer had earlier told police that he was trying to holster his firearm while in his car when he accidentally fired, shooting his son inside the car. He rushed his son to Aga Khan Hospital where he was pronounced dead on arrival. The lawyer is currently admitted at Nairobi hospital under police guard after suffering blood pressure complications while in police custody. Police have submitted the firearms certificates and identification card to the Firearms Licensing Board for verification.